After months of trying, I've finally got my hands on a Nintendo NES Classic Mini. It's everything I wish retropie was: simple, reliable, plug-and-play gaming. I didn't have a NES at the time, so the games are all mostly new to me (although I'm familiar with things like Super Mario Brothers). 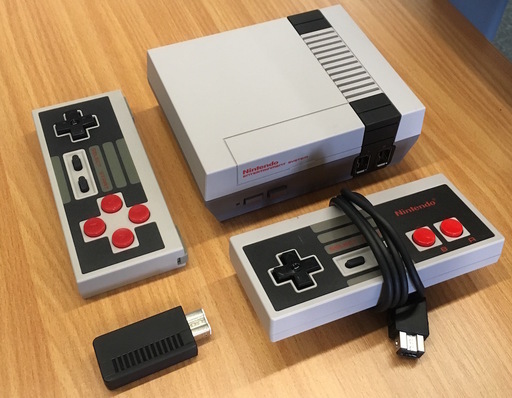 The two main complaints about the NES classic are the very short controller cable and the need to press the "reset" button on the main unit to dip in and out of games. Both are addressed by the excellent 8bitdo Retro Receiver for NES Classic bundle. You get a bluetooth dongle that plugs into the classic and a separate wireless controller. The controller is a replica of the original NES controller. However, they've added another two buttons on the right-hand side alongside the original "A" and "B", and two discrete shoulder buttons which serve as turbo-repeat versions of "A" and "B". The extra red buttons make it look less authentic which is a bit of a shame, and are not immediately useful on the NES classic (but more on that in a minute). With the 8bitdo controller, you can remotely activate the Reset button by pressing "Down" and "Select" at the same time. Therefore the whole thing can be played from the comfort of my sofa. That's basically enough for me, for now, but in the future if I want to expand the functionality of the classic, it's possible to mod it. A hack called "Hakchi2" lets you install additional NES ROMs; install retroarch-based emulator cores and thus play SNES, Megadrive, N64 (etc. etc.) games; as well as other hacks like adding "down+select" Reset support to the wired controller. If you were playing non-NES games on the classic, then the extra buttons on the 8bitdo become useful.